Since the start of the 2013 season, the State Theatre in Salzburg, Austria, has operated with a sound system from Dutch manufacturer Alcons Audio. The new acquisition was made because the existing sound system was not able meet the increased demands on the in-house sound system. 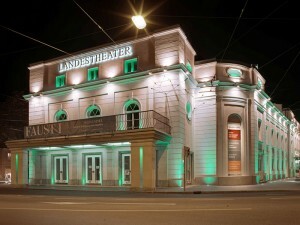 As a so-called "Viersparten" (four artistic divisions) theatre, the State Theatre makes particularly high demands on sound reinforcement, as it offers its audience musical theatre (opera, operetta, musicals), ballet and drama as well as children's theatre. This wide range of productions had to be sonically supported to the highest standard. "A sound system in this house must be in a position to reinforce a rock band, classical music, vocals and subtle music cues for theatre plays with the finest resolution," says Timo Hintz, head of sound. In addition, the new sound system was expected to have discrete optics, not affecting the ambience of this traditional venue. The team of Protones Veranstaltungstechnik (event technology) around Florian Buhr was commissioned with the installation and calibration of the Alcons system, resulting in excellent sound quality, even at high SPL’s, in all areas, much to the satisfaction of the State Theatre. Systems from the Alcons L and V Series are applied; with two line arrays, each consisting of six LR7s as well as two VR8s as front fills, the theatre is now superbly equipped for all kinds of stage productions. Now, for the first time, the entire room including the balcony is seamlessly covered, with a flat sound pressure level and a consistent tonal balance. Furthermore, the very compact size of the Alcons system was also decisive for the choice of the Salzburg State Theater; too large a system would have partially blocked the installed lighting. In addition, the allowed working load limits had to be taken into account, for which again the Alcons system offered the best solution. "I can only say, based on the experience to date this season, that all expectations have been fully met. I am very pleased and very impressed by the sound, which is also the general opinion in the house. It’s also even noticed by every layman how good the sound is now," said Hintz.